airports, food, Hotels, Malaysia, Portugal, Restaurants - let's eat chic, Transport - planes, trains and automobiles, Travel - bon voyage! Until November, Lisbon was uncharted territory for Monsieur and me, yet we’d decided to go and check out both Lisbon and Madeira for various reasons, being: (a) we’d never been to Portugal, (b) the flights and accommodation were insanely cheap as November is low season, (c) it’s not too far from us in London and (d) the weather would be considerably warmer than in England. We also had a bunch of leave to use up before the end of the year. We’d heard unending positive reviews from those who’d been there before us. One colleague has a holiday home in the Algarve and another goes to Portugal for R&R every year without fail. The Epic Brother had visited friends there earlier in the year and raved about the Portuguese, how helpful and welcoming and warm they are without being flashy or in-your-face. Then others told me that to be in Portugal was like being in a world between worlds; that sometimes it seems modern and at others it’s quite medieval, but nonetheless enchanting. Monsieur and I were now keen to check it out for ourselves. Our first good impression on arriving in Lisbon was created by the weather: for a Northern Hemisphere November, to find 18 degrees Celsius awaiting us at 7.30pm on a Friday night was an excellent way to start our holiday. Customs was unusually straightforward, the luggage caroussel quick to produce our suitcases, and, as an added bonus for the traveller disembarking with a growl in their tum – all around baggage claim were opportunities to grab a snack. There were little shops selling food, a well-stocked café, and a woman with a trolley laden with crisps, drinks and plastic containers filled with fresh fruit. Now, that’s what I call civilised. On a more romantic note, as we waited for our bags, a tall black man walked past us in robes of flowing gold. 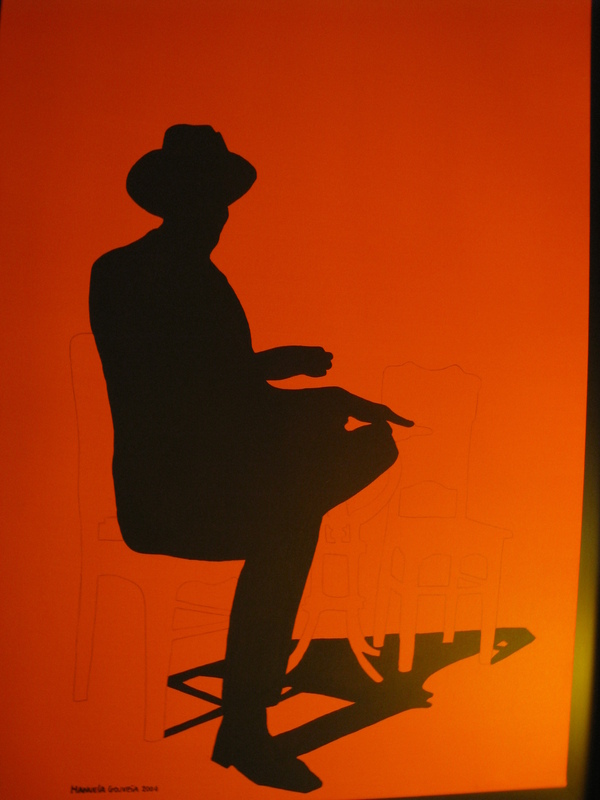 On his feet were pointy-toed slippers of cream silk and on his head sat a loosely-wound turban. Not only was the man a reminder of Portugal’s colonialist ties, he was the picture of orientalist elegance as he glided on by, a good head or more taller than anyone else in the hall, his robes glistening against the blue-black of his skin. Once land-side, I noticed something rarer than a two-trunked elephant: a properly-stocked information desk with real maps, not just those freebie maps for tourists that only show one in four streets (never the one you’re actually looking for) and which never, ever show the routes to or from the airport. Here at Lisbon airport there were city maps, regional maps and maps of the entire country, stood on racks alongside guides from various publishers. This is just what’s needed at every airport in the world. I was impressed. We didn’t wait long for a cab to our hotel on Avenida da Liberdade and our driver was patient with our novice attempts at speaking Portuguese, phonetic phrasebook in hand. The road leading away from the airport was lined with big, square houses, reminiscent of the architecture we’d seen in Melaka, Malaysia, where the Portuguese once ruled the roost. Many sported a deep rusty red colour, also familiar from our Malaysian travels. It struck me that we’d seen the effects of a country out there before understanding it’s background, which was now right here in front of us. It may be a back-to-front way to travel, but it works. It was also soon apparent that the Lisboetas like their monuments, especially large ones parked at the centre of busy roundabouts. We circled two elaborate examples and spotted a couple more during the 15 minute ride to the hotel, and would see a lot more in the course of the next few days. Lisbon’s stonemasonry rocks. 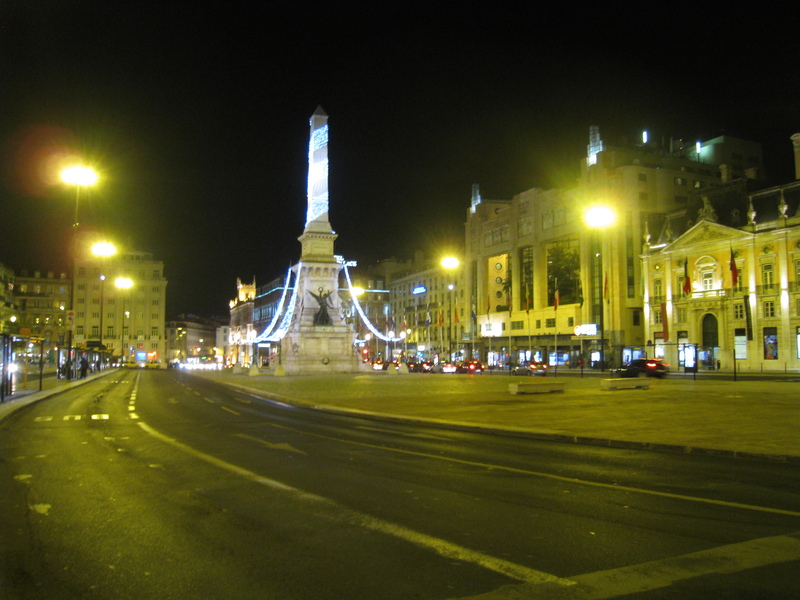 A modest €7.00 later, we arrived at the Avenida da Liberdade. It is a long, wide thoroughfare, with dual carriageway through the middle separated from extra lanes at either side by islands planted with mature trees. For November the branches were decorated with weepy drops of twinkling white lights and one corner building was wrapped like a gift box with a gigantic illuminated bow, a hint that Christmas would be upon us within a matter of weeks. Monsieur and I like the Accor hotel chain when we travel. They always look after us well. This time we were staying at one of their Sofitels. The lobby was decorated in reds and blacks and golds in what would have been quite an asiatic style but for the pair of golden angels clinging to the wall behind reception. The concierge treated us to free welcome drink vouchers and a room upgrade as we checked in – another positive to travelling out of season, no doubt – and a few minutes later we were walking into our room overlooking the Avenida. Once again the décor had the hint of asia with dark wooden furniture of Japanese style and the walls hung with striking paintings of silhouettes on a red background – by Manuela Gouveia. 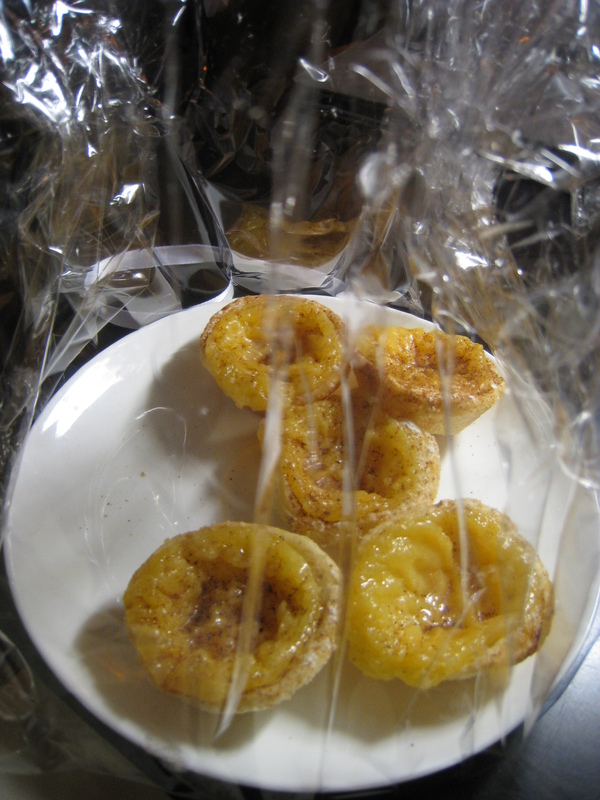 There was also an unexpected surprise waiting for us: on the desk sat a cellophane-wrapped plate of half a dozen pasteis da nata, or the special custard-filled tarts for which Lisbon is famous. 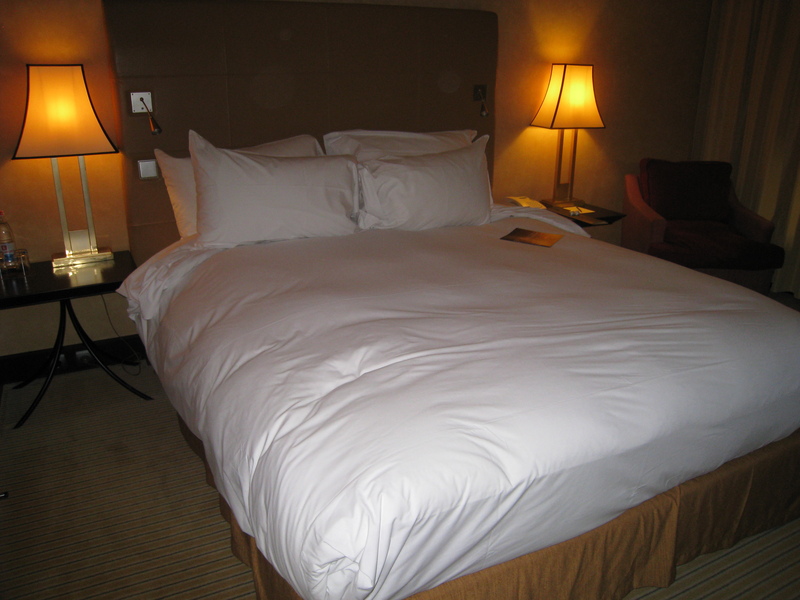 But best of all was that Sofitel bed. All you have to do is look at one to know that when you slip into it, the linens will be cool and their trademark mattress topper will support you in such luxurious comfort that you will dream of sleeping on marshmallow beds in a land constructed entirely of clouds. Monsieur and I are not the only ones who feel this way, either; next to the bed was a brochure outlining Sofitel beds and Sofitel pillows and the Sofitel bed linens and mattress toppers and everything you could possibly wish for when trying to recreate the Sofitel bed experience at home. Alas, the prices are steep. You’ll have to be an exceptionally good girl or boy for Santa to put Sofitel bed things in your stocking at Christmas. Either that or exceptionally rich. Before we could even think about sleeping, however, Monsieur and I had a date with a rotisserie chicken at the nearby Bom Jardim restaurant. It was time to see whether this bastion of Portuguese chicken was all it was cracked up to be. I’ve been hanging out for your take on Portugal. I’ll have to check out the Sofitel next time I’m in Europe as I found the beds quite hard in most of the places we stayed in during our recent trip over there. I’m looking forward to your articles on the food that you came across while you were there. Well, Razz, better late than never, as the saying goes! I’m at home today thanks to combination of snow, travel issues and The Headcold That Came To Stay. I’ve been snivelling since before Xmas now. In spite of aloe-imbued tissues, my nose is red, unattractive and hurts. But it does mean that while I sit in my snotty-nosed state of dishevelment, I can put up the next post in the Portugal series. I wrote it at the weekend so all I need to do now is press publish. Easy. This one will be mostly about chicken. As for the hard beds in Europe – I know what you mean! The worst ones are in the Latin countries, where everyone pushes two single beds together and covers them with double sized linens. Who on earth thought that was a comfortable way to sleep? Either Monsieur or I always end up falling down the crack in the middle of the bed, in the middle of the night. Someone needs to sort out the hoteliers of Italy, Spain and Portugal (apart from the Sofitels!) and tell them that double room means double bed and twin room means twin beds but double room DOES NOT mean twin beds disguised as a double. Bad, bad, bad. And blimmin uncomfortable. I’ve read these entries back-to-front ways, but it still works. I think you were the pastry wolfer. PR – hah! You are no Miss Marple, my Planetary Pal! ‘Twas the Lightning Quick Monsieur le Peckish that gobbled up that first custard tart! I was busy fiddling with my camera so barely noticed the flash of his hands as he grabbed and gobbled (the edible tart, that is). But I admit, I wasn’t far behind.